Image caption The council said the five houses will be demolished "piece by piece"
The demolition of five houses left hanging over a sheer drop following a landslip has been delayed after further earth movement. Scarborough Council said it had abandoned plans to carry out the work during darkness as it needed to monitor the situation in daylight. The landslide, overnight on Tuesday, has left the row of terraced houses on Aelfleda Terrace in Whitby, North Yorkshire, structurally unsafe. Work is expected to start on Saturday. Scarborough Borough Council said: "Initially, we wanted to do the work around the clock but risk assessments indicated it would be unsafe to do so at night time with the ground so unstable. "It's absolutely imperative we have the ability to see any ground movement in the wider area." The council said the houses would be taken down "piece by piece" by workers using a cherry-picker. 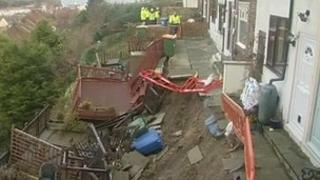 The council said the cause of the landslide was not yet known and only one of the properties had been occupied. Meanwhile, a few hundred metres further along the headland the owners of a 140-year old kipper smoking house fear a landslip may threaten their property. Barry Brown, 56, a partner at Fortunes, on Henrietta Street, said the small landslip had resulted in broken drainage pipes with mud and a small amount of rock moving. He said: "At the moment I'm very concerned, it's [the land] moving towards us, but it has a way to go."